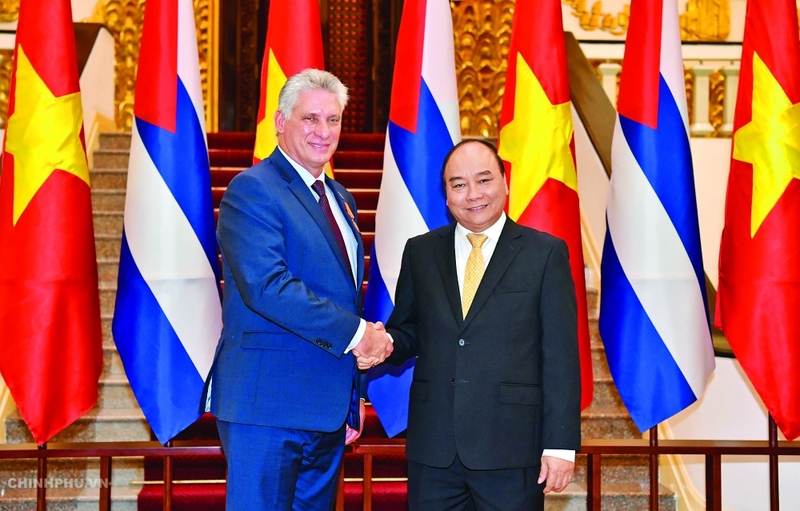 (VEN) - Vietnamese Prime Minister Nguyen Xuan Phuc and Cuban President of the Council of State and Council of Ministers Miguel Mario Diaz Canel Bermudez, meeting recently in Hanoi, set a goal of doubling their countries’ bilateral trade volume within the next four years. Since Vietnam and Cuba first established diplomatic relations on December 2, 1960, Vietnam has become Cuba’s second largest trading partner in Asia and Oceania. In recent years, two-way trade turnover has grown at 10-15 percent per year to reach US$218 million in 2015 and about US$230 million in 2016 and 2017. Vietnam exports food, cereals, confectionery, footwear, ceramics, building materials, garments and textiles, and chemicals to Cuba. Despite being one of the top 10 countries with the highest trade turnover with Cuba, Vietnam’s export value to Cuba remains modest, not meeting its potential. Therefore, leaders of the two countries agreed on measures to promote bilateral cooperation by tapping existing cooperative mechanisms and exchange visits; carrying out their new trade agreement; and seeking efficient solutions to boost cooperation with regard to the two countries’ specific economic characteristics and management mechanisms. They agreed to task ministries and agencies to facilitate investment in such new domains as telecommunications, energy, building material production, consumer goods, biotechnology, pharmaceuticals, healthcare, and others. They also agreed to coordinate on organizing the 36th meeting of the intergovernmental committee later this year, and increasing the exchange of visits at all levels and the sharing of experience in socioeconomic development. An agreement between the governments, which frees Cuba from any debts to Vietnam was also confirmed. Total debts were previously about US$143.7 million. According to Bermudez, Cuba is facing many difficulties in accessing finance, technology and materials due to the commercial and financial embargo imposed by the US. Therefore, the presence of Vietnamese businesses in Cuba will contribute to helping it overcome difficulties and promote economic development. The Cuban people trust many Vietnamese goods while Vietnamese businesses are operating effectively in the country, Bermudez added. 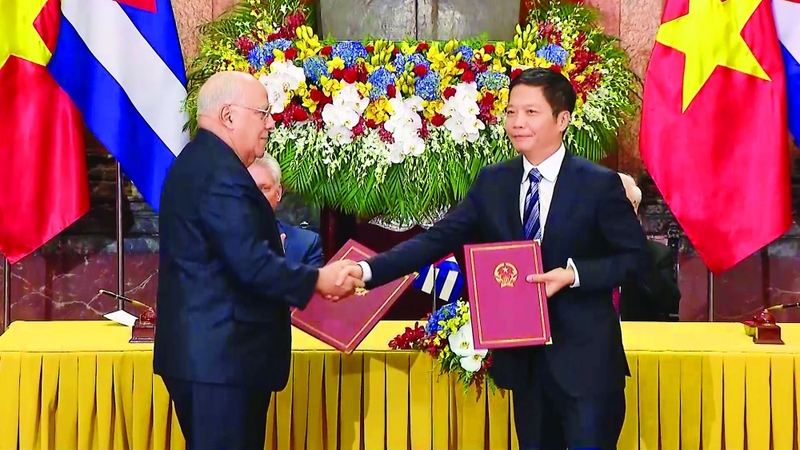 Vietnamese Party General Secretary, President Nguyen Phu Trong and Cuban President of the Council of State and Council of Ministers Miguel Mario Diaz Canel Bermudez witnessed the signing of a number of cooperation documents between the two countries, including a trade agreement and a financial protocol on cooperation in rice production during the 2019-2023 period.